That is one creepy cover. Appropriate!! LOL@ Marybelle! I don't like the way Voss's eyes look on the cover---not how he's described in the book. I love getting in on the ground floor of a new series. Thanks for the great review, Gannon! I'm a huge fan of Colleen's Gardella Vampire Chronicles, so I'm sure to enjoy this one, too. Thanks for the great review, Gannon! I love getting in on the ground floor of a new series. This is a good one, PJ! I'm a huge fan of Colleen's Gardella Vampire Chronicles, so I'm sure to enjoy this one, too. Andrea, you were the first person I thought of when I was reading this. *g* Can't wait to hear what you think! 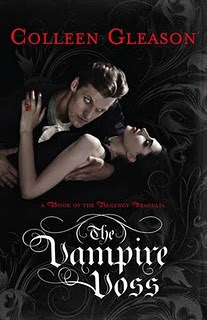 The cover gives an old style vampire feel to it. It is great the books are coming out so close together. I hate having to wait for the series to be complete. Wow, Gannon, this book sounds pretty intense. I have yet to read any of Colleen's stuff though I have heard so many great things about her writing. Great review! You're right, librarypat, it does have that "old style" vampire feel.